"I hate to call them 'boys.' They're known that way in the county. I'm pretty sure they don't think it's putdown, but it feels like one to me." On June 6, 1990, 64-year-old William Ward was found dead in his bed, a bed he shared with his 59-year-old brother Delbert, in the sleepy farming town of Munnsville, New York. William Ward was one of four brothers, know collectively by the locals as "The Boys," an elderly quartet of simple, quiet, near hermits who lived in a cluttered, rundown farmhouse, completely devoid of heat or running water. Though at first it seemed as if William had died of natural causes, it was not long before news spread amongst townsfolk that Delbert Ward had confessed to authorities that he had actually been responsible for his brother's death. Documentary filmmakers Joe Berlinger and Bruce Sinofsky found cinematic lightning in a bottle with Brother's Keeper, their filmmaking debut that snagged a Sundance Film Festival Audience Award in 1992. They have created a marvelously sad, haunting film, one deeply immersed in the lives of Delbert, his surviving brothers Lyman and Roscoe, and a quirky and oddly homespun batch of Munnsville residents, even as the story surrounding William Ward's death becomes increasingly stranger and more surreal. When one neighbor comments that Delbert wouldn't know the difference between waiving his rights and waving to someone across the street, it is apparent that the simple-living Ward boys could have easily been plucked out of another century. Was William's death one of natural causes? Did Delbert kill him? Was it euthanasia? Or was there perhaps some darker, even more sordid event that acted as a catalyst for murder? Did the police coerce a confession out of Delbert? Those are the questions that Berlinger and Sinofsky let dangle, and as Delbert's story develops, and moves toward what seems like an unavoidable criminal trial, the filmmakers are there in real time, capturing all of the events as they unfold. The smalltown microcosm of Munnsville begins to build a ground swell of support for Delbert and his brothers, and Berlinger and Sinofsky seem to become nearly invisible as they turn into unobtrusive, fly-on-the-wall documentarians, drawing heartfelt insight from neighbors. Their lingering camera shots, of such unpleasant events as nervous Lyman's gutwrenching appearance on the witness stand (an example of one of the film's harshest and more emotionally volatile moments), will likely linger with viewers long after the film has ended. Like ground-breaking directors Jean Rouch and Jean-Luc Godard did with experimental French films in the 1960s, Berlinger and Sinofsky have adopted a cinema verite style for Brother's Keeper, and their blending of traditional and non-traditional techniques at times makes this play more like a feature film than a documentary. It's an approach that layers the story of Delbert Ward with an urgency and immediacy that is often lacking in "after the fact" documentaries, and the uncertainty of the outcome and the weirdly captivating lives of the Ward "boys" really make for an enthralling story. 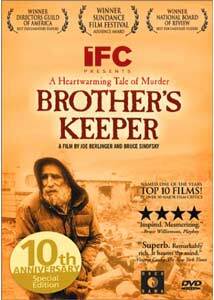 Image Transfer Review: Docurama has issued this 10th anniversary release of Brother's Keeper in its original 1.33:1 format. The print has a fair amount of grain, likely due to the fact that it was first shot on 16mm, and then transferred to 35mm, but these minor shortcomings do little to really distract from a solid looking presentation. Obviously this isn't as crisp or sharp as a feature, but as a documentary it looks more than presentable. Audio Transfer Review: Like most documentaries, the audio presentation is very basic, offered here in simple 2.0 Dolby Digital stereo. Voices are clearly audible, though there isn't much here in the way of encompassing dynamics. But then again, this is a documentary, and the audio mix is more than adequate. Extras Review: Leading the charge of extras on this release is a full-length commentary from filmmakers Joe Berlinger and Bruce Sinofsky. They chatter non-stop, providing a very informative mix of behind-the-scenes stories and production tidbits, wisely bypassing the typical fallback narration of what's happening onscreen that so often cripples other commentary tracks. As an added bonus, Berlinger and Sinofsky even weigh in, after all these years, with their personal feelings about what really happened to Bill Ward. Also included is the short film The Wards Take Manhattan (11m:40s), which was considered as a possible coda for Brother's Keeper. Filmed in 1991, Berlinger and Sinofsky shot footage that follows the Wards visit to New York City (their first time), and as they wander past the World Trade Center, Times Square, and Central Park, you get the feeling that there may have been the potential for a whole other documentary here. The unconventional theatrical trailer is an unexpected treat. It features monologuist Spalding Gray seated in a chair, simply talking about the film and how much he loved it. It's unusual, funny, and something of a coup. A sixteen image Photo Gallery, filmmaker bios, and a batch of Docurama trailers complete the supplements. The disc is cut into 12 chapters, and does not feature any subtitles. Brother's Keeper is a strangely moving and highly memorable documentary from Joe Berlinger and Bruce Sinofsky, finally on DVD just in time for its 10th anniversary. The story swirls in unexpected directions, and the filmmakers are honest and unflinching in the presentation of their subjects. Docurama has done its usual outstanding job with the DVD release, though the film itself is so engrossing that it would be recommended even if it was issued barebones (which it thankfully wasn't). Highly recommended, and easily one of the year's best releases.